Order your copy of A Love Like Ours by May 17th to have part of your proceeds go to the†Intrepid Fallen Heroes Fund†(more details on the Launch). When Lyndie James, Jake’s childhood best friend, returns to their hometown of Holley, Texas, Jake cautiously hires her to exercise his Thoroughbreds. Lyndie is tender-hearted, fiercely determined, and afraid of nothing, just like she was as a child. Jake trusts her with his prized racehorse, Silver Leaf, then battles his hopes for his horse against his increasing fear for Lyndie’s safety. Though Jake and Lyndie have grown into very different adults, the bond that existed during their childhood still ties them together. Against Jake’s will, Lyndie’s sparkling, optimistic personality begins to tear down the walls he’s built around his heart. A glimmer of the hope he’d thought he’d lost returns. 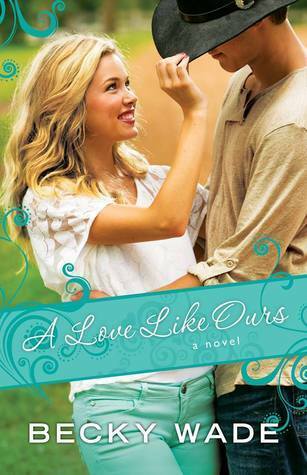 Will Jake ever be able to love Lyndie like she deserves, or is his heart too shattered to mend? What a great read this is the first book I have read by this author and it will not be the last. Lyndie and Jake are a cute couple and it was great seeing them come together and watch them grow. As they work through Jakes PTSD and Lyndie’s determination you find yourself pulling for both characters. During her childhood in California, Becky Wade†frequently produced homemade plays starring her sisters, friends, and cousins. These plays almost always featured a heroine, a prince, and a love story with a happy ending. She’s been a fan of all things romantic ever since. Becky and her husband lived overseas in the Caribbean and Australia before settling in Dallas, Texas. It was during her years abroad that Becky’s passion for reading turned into a passion for writing. She published three historical romances for the general market, put her career on hold for many years to care for her kids, and eventually returned to writing sheerly for the love of it. Sheís delighted to be penning warm, wry, and heartwarming contemporary romances for the Christian market. She’s the Carol Award and Inspirational Reader’s Choice Award winning author of My Stubborn Heart, Undeniably Yours, and Meant to Be Mine. Thank you for the review and for being part of the tour.